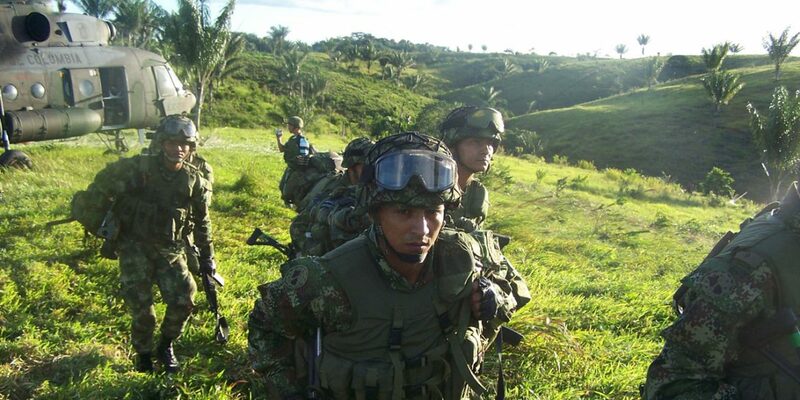 According to local media, military forces, police and special forces were engaged in combat with Guacho’s “Oliver Sinisterra Front” (FOS) in several parts of the southwestern Nariño province. Ecuadorean security forces said they have also stepped up operations along the Colombian border to prevent the FARC dissident leader from entering his native country. Guacho, who abandoned the peace process with the FARC last year, was “seriously injured” early Saturday after being hit by a military sniper’s bullet, according to President Ivan Duque. Defense Minister Guillermo Botero said Saturday that Guacho’s men were able to remove their leader from the area where he was shot to prevent his arrest. Since then, security forces have been engaged in a major manhunt to either kill or capture the FARC dissident leader who has been terrorizing the Pacific coast of Nariño while trying to assume control over regional drug trafficking routes. Hospitals in the region are monitored permanently to make sure Guacho is arrested as soon as he seeks professional medical assistance, Botero said. We are fully operative; all the hospitals, health posts and places where there are doctors are monitored, etc because if they are going to one of those centers, they will be captured. Newspaper El Colombiano reported heavy combat between security forces and guerrillas in the municipalities of Tumaco, where the FOP leader was allegedly injured, and the neighboring Roberto Payan. While Colombia’s security forces are frantically trying to locate Guacho, an anonymous Ecuadorean official told local newspaper El Universo that Ecuador’s security forces have been trying to close the jungle border. We are active along the entire border after the fighting on the Colombian side. The riverside populations of Palma Real, Tambillo, Limones , Borbón, San Lorenzo have been reinforced, as well as Mataje, La Cadena, El Pan, Corriente Larga near the Puerto Rico border crossing. El Universo reported that hospitals are also being monitored on the Ecuadorean side of the border where the FOS has also been active. Guacho was born in a coastal community on the Ecuadorean side of the border and joined the FARC 10 years ago. His group has since grown and is believed to contain a few hundred members who have been using the porous border to traffic cocaine from Nariño to markets in both North and South America through port towns on both sides of the border.